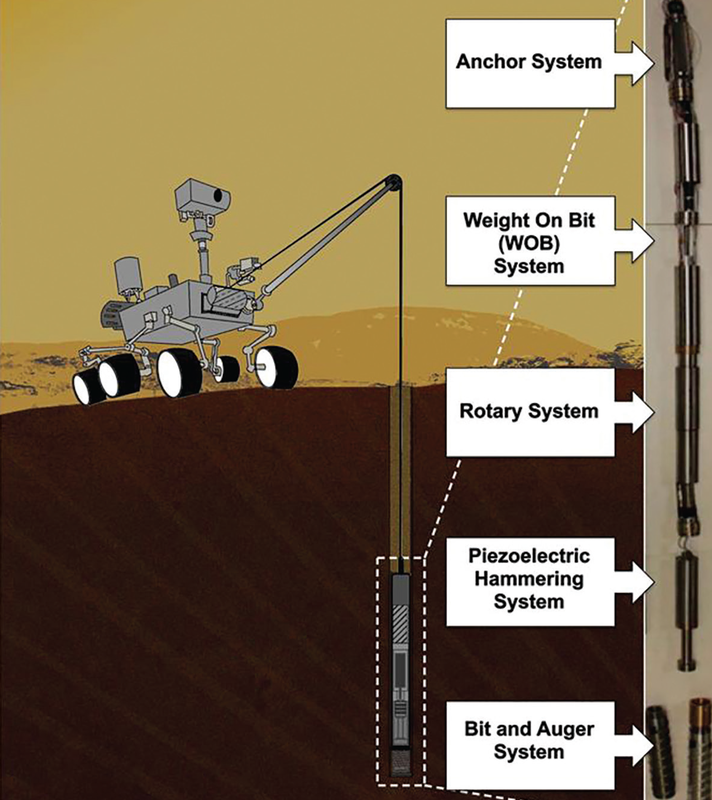 SMD is supporting development of a deep-drill sampler called the Auto-Gopher for potential deployment in future space exploration missions. An initial version of the Auto-Gopher-1. Technology Development: The ability to penetrate subsurfaces and collect pristine samples from depths of tens of meters to kilometers is critical for future exploration of bodies in our solar system. SMD is supporting development of a deep-drill sampler called the Auto-Gopher for potential deployment in future space exploration missions. The Auto-Gopher employs a piezoelectric actuated percussive mechanism for breaking formations and an electric motor to rotate the drill bit and capture powdered cuttings. It incorporates a wireline architecture; the drill is suspended at the end of a small diameter tether that provides power, communication, as well as structural support needed for lowering and lifting the drill out of the borehole. Thanks to this unique architecture, the maximum drilling depth is limited only by the length of the tether. The wireline operation used on the Auto-Gopher removes one of the major drawbacks of traditional continuous drill string systems—the need for multiple drill sections that can add significantly to the mass and the complexity of a deep drill. As such, the Auto-Gopher system mass and volume can be kept quite low for shallow or deep holes. While drilling, numerous sensors and embedded instruments can perform in situ analysis of the borehole wall. Upon reaching a preset depth, the drill is retracted from the borehole, the core and/or cuttings are removed for detailed analysis by onboard instruments, and the drill is lowered back into the hole to continue the penetration process. Illustration of the Auto-Gopher concept as a wireline deep drill. Impact: The Auto-Gopher is intended to help scientists answer one of the most pressing questions in science: Has life ever existed anywhere else in the universe? Since water is a critical prerequisite for life, as we know it, NASA exploration missions are targeting bodies in the solar system that are known to have or have had flowing liquid water. The latest Planetary Decadal Survey (Vision and Voyages for Planetary Science in the Decade 2013-2022) recommended that NASA explore three solar system bodies with accessible aqueous regions: Mars; Jupiter’s moon, Europa; and Saturn’s moon, Enceladus. Each of these bodies poses different drilling-related challenges. Drilling on Mars requires penetrating dry rock and regolith that have physical properties (i.e., tensile strength, hardness, etc.) that can vary many orders of magnitude though the drill depth. A drill on Enceladus and Europa will need to operate in ice at temperatures below 100 K, while accounting for the low gravity on Enceladus or the high surface radiation on Europa. The Auto-Gopher must be designed to achieve its goals of penetrating the subsurface to great depths, capturing pristine samples, and delivering those samples to onboard instruments for analysis or for potential sample return—all in the harsh conditions encountered in space. Illustration of the Auto-Gopher concept as a wireline deep drill. Status and Future Plans: The aim of the Auto-Gopher development effort is to demonstrate a scalable technology that makes deep drilling possible using current launch vehicles and power sources. This technology development has been accomplished in several generations including the Ultrasonic/Sonic Driller/Corer, Ultrasonic/Sonic Gopher, and the Auto-Gopher-1. In 2015, PSD awarded a project under its MatISSE program to support the next generation of Auto-Gopher technology development—the Auto-Gopher-2. In 2015, the project produced a core breaker and retaining mechanism and demonstrated their operation. This latest drill is also being designed to house electronics, sensors, and mechanisms needed for autonomous drilling, and the critical subsystems are currently being breadboarded and tested. 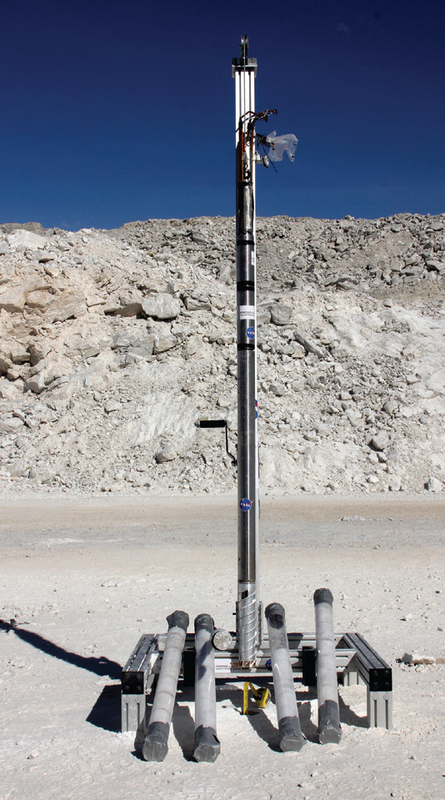 Future planned activities include field trials to validate drill operation in harsh conditions at a U.S. gypsum quarry (gypsum can change from hard crystalline gypsum, to soft sugar gypsum, to very hard anhydrite with numerous clayrich veins) and inside a vacuum chamber, drilling in ice at approximately -100°C. Sponsoring Organization: The research, led by PI Kris Zacny of Honeybee Robotics, is funded by the PSD’s MatISSE program, and jointly developed with the Jet Propulsion Laboratory (JPL)/California Institute of Technology.